Hello and Happy Tuesday! Hopefully your week is off to an awesome start and you had a wonderful weekend! I had a super fun weekend with my daughter and two of our granddaughters! Two of her friends gave her a wonderful baby shower! In just about two months I should be waiting patiently for little Blakely Addison Rose to make her appearance into the world! 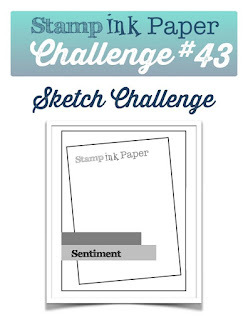 The week over at Stamp, Ink, Paper we have an awesome sketch for you! I hope you'll head over and check out all of the inspiration we have for you and then link up a card of your own! I was going through some of my stamps today and ran across an awesome Fishing Net Background Stamp from Our Daily Bread that I had NEVER used! Well I love this stamp and I was itching to use it.. so I did. I paired it with a couple of images from the Stampin' Up! By The Tide stamp set. 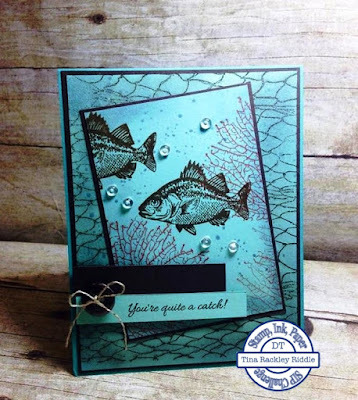 I also used some of a splatter stamp from Gorgeous Grunge and then a Gina Marie Fishing Sentiment. My card base was an 11" x 4 1/4" piece of Bermuda Bay Cardstock that was scored at 5 1/2". I added a 4 1/8" x 5 3/8" piece of Early Espresso. Next on a piece of 4" x 5 1/4" piece of Coastal Cabana cardstock ( I know it's retired.. I'm hoarding it! ), I stamped the Fishing Net Background stamp in Soft Suede Ink. I sponged some Tim Holtz weathered wood distress ink on the edges of the Fishing net image. I also stamped some of the splatters from the Gorgeous Grunge stamp set with Weathered Wood onto the Net background. I then attached it to the Early Espresso layer with Tombow Multipurpose Glue. Next I stamped the Coral image with Calypso Coral onto a piece of 2 x 3 1/4" piece of Coastal Cabana cardstock. I also stamped some of the splatters from Gorgeous Grunge ink onto it using more of the Tim Holtz Weathered Wood Distress Ink. I sponged the edges of that piece with Weathered Wood as well. I stamped the fish with Early Espresso once in the center of the cardstock and once on the left side stamping partly off the cardstock. I attached this panel onto a piece of 2 1/8" x 3 3/8" Early Espresso Cardstock. These were then attached onto the Fishing Net layer at an angle (like the sketch) with more Tombow multipurpose glue. I attached a few Pretty Pink Posh dew drops with Alene's adhesive. I added the Early Espresso strip with foam tape. The sentiment from the Gina Marie Fishing Stamp set was stamped in Early Espresso ink onto Coastal Cabana and added with Foam tape as well. I threaded some Linen Thread into a metallic button and attached it with glue dots and called this one done! Love the fishing net stamp! Thought at first it was the dsp from going global.great card! Amazing card, Tina! Love the great underwater scene you created! SIP Challenge #45 - Welcome Baby!